An adult female and two children were injured in a single car MVC on Bells Hwy at the intersection of Eddie Chasteen Drive Saturday evening 31-December at 22:45. The east bound car left the roadway in a curve, striking a large business sign before colliding with a power pole. The children received non-life threatening injuries and were able to exit the vehicle on their own. The female driver was trapped in the wreckage. Click here for more information. 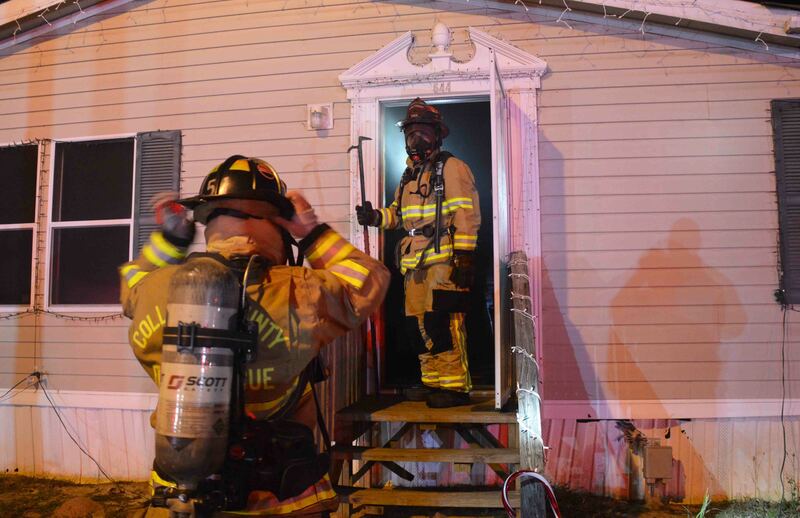 A Green Pond family was displaced following a fire in their home Friday evening 30-December at 21:11. 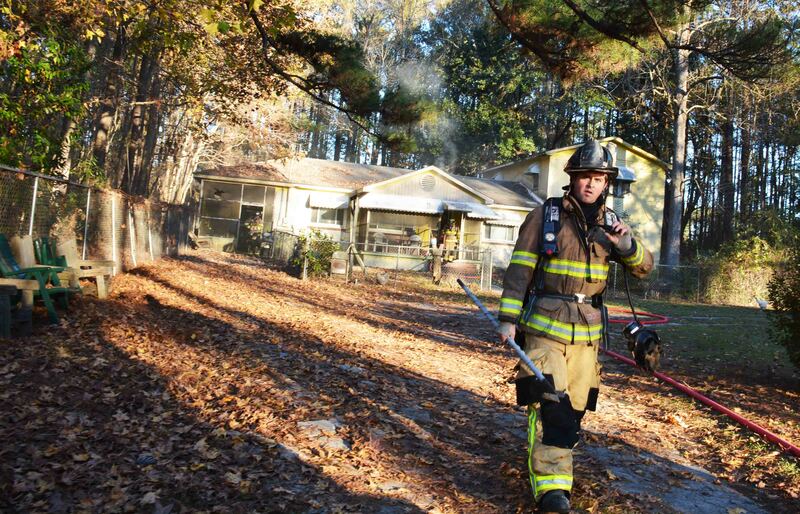 The family returned from church to find smoke coming from the residence. Engine 6 arrived minutes later, reporting light smoke conditions and flames visible from the rear of the doublewide mobile home. Firefighters deployed one 1-3/4 handline, broke a rear window and extinguished the fire from the exterior saving the home. They then entered the dwelling to check for any extension. Click here for more information. 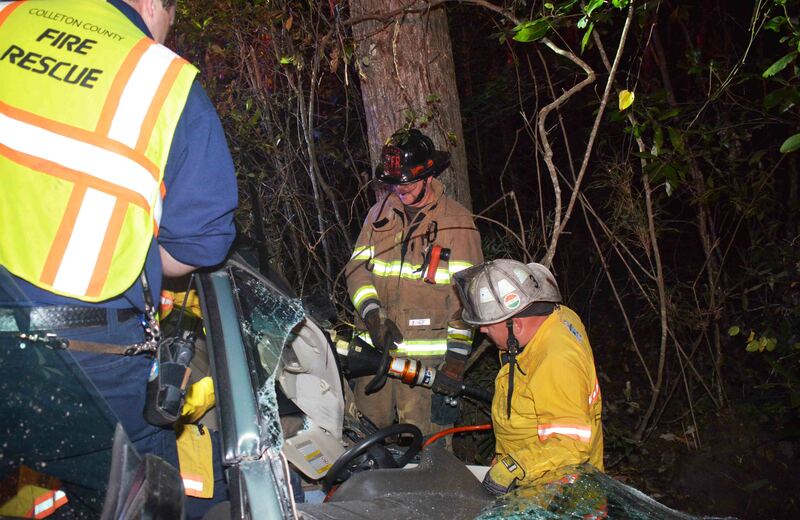 A 68 year old Walterboro man was seriously injured in a single car MVC on Doctors Creek Road just north of Penny Creek Drive. The 2004 Subaru left the roadway at a high rate of speed, narrowly missing a Sheriff’s Deputy and began to overturn. It spun backwards and hit a tree roof first, crushing the roof into the interior and trapping the driver. The man suffered multiple traumatic injuries. Click here for more information. Six people were injured in a two vehicle high speed collision on I-95 northbound near the 46 mile marker Thursday evening 22-December at 22:47. Two vans, one full sized and one compact, were traveling northbound when they collided and entered the median. The minivan overturned after rolling over at least once. Firefighter-Paramedics from Medic 13 arrived to find multiple patients and requested three additional ambulances. 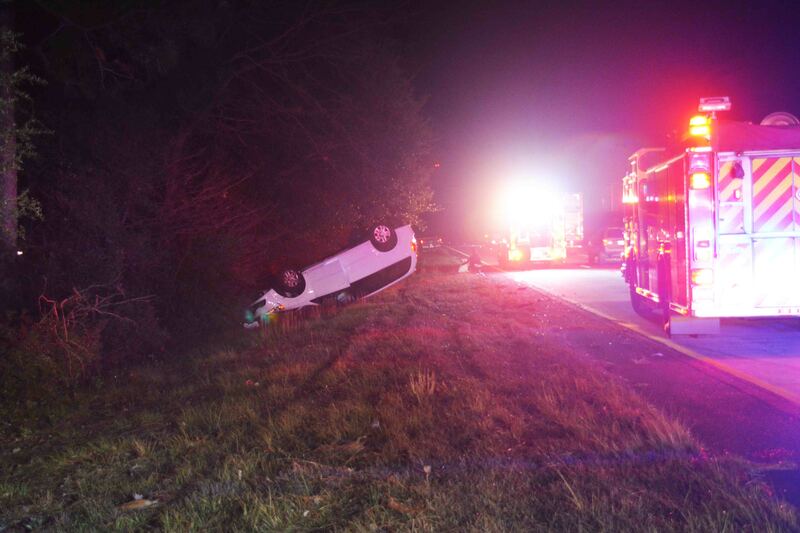 A 10 year old Jacksonville male was critically injured and found unconscious in the overturned minivan. Click here for more information. Our thoughts and prayers go out to the family and friends of Gene Rushing and our brothers and sisters at the Hampton County Fire Department. Chief Rushing, a former Chief of the Hampton County Fire Department, passed away this morning. Visitation will be 1700 - 2000 on Tuesday, December 20th at First Baptist Church in Hampton (300 Jackson Avenue East), and funeral services will be at 11:00 on Wednesday, December 21st at Hampton First Baptist Church in Hampton with a burial following at Union Cemetery in Scotia. The family suggests that those who wish may send memorials to the Gene Rushing Memorial Fund, 703 Second Street West, Hampton, SC 29924. Firefighter/Paramedic Kristin Dias was recently recognized by News 2. Click here for more information. 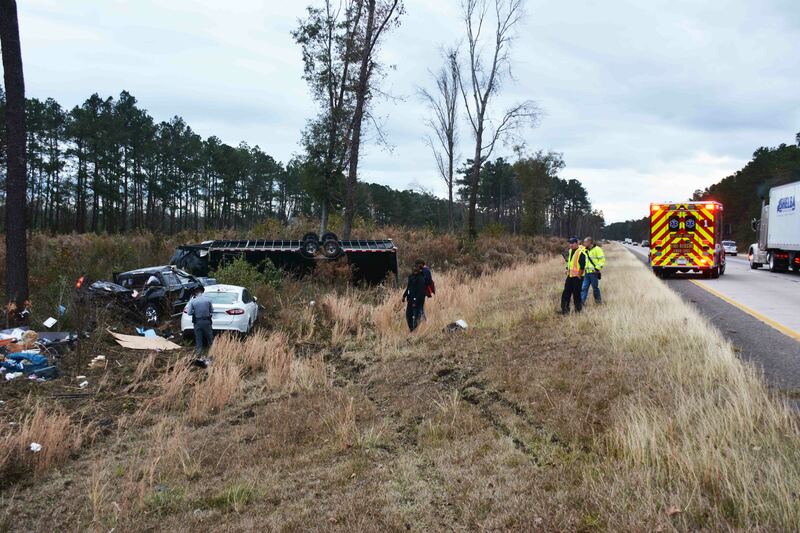 Two people were injured in a two vehicle high speed crash on Interstate 95 near the 52 mile marker southbound Sunday afternoon 11-December at 15:50. Witnesses advised a southbound pickup truck pulling a large enclosed trailer suffered a tire blow out. The truck lost control and collided with a another southbound vehicle causing both to enter the median. The pickup truck rolled over, as did the trailer. Click here for more information. 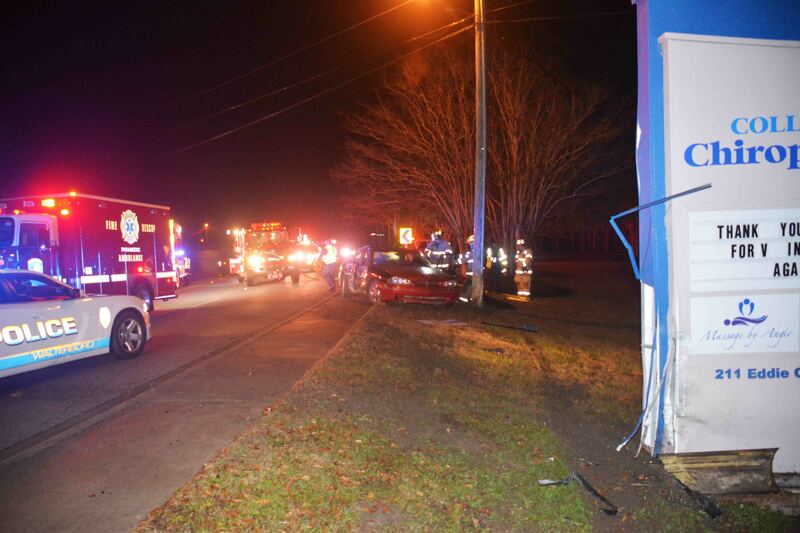 A two vehicle MVC sent four people to the hospital with non-life threatening injuries Saturday evening 10-December. 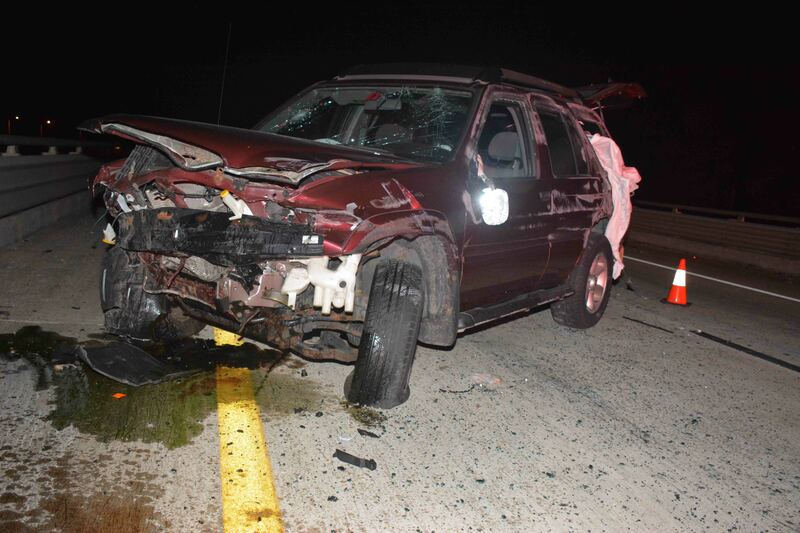 A 21:45 a southbound Pathfinder collided with a guardrail at the Exit 62 overpass. The vehicle crossed both lanes and struck the bridge abutment then flipped over, but landed upright after crossing both lanes a second times. Bystanders stopped to assist and removed the driver, seconds before the Pathfinder was struck by a southbound KIA Sorrento. None of the bystanders were hit by the second vehicle. Click here for more information. 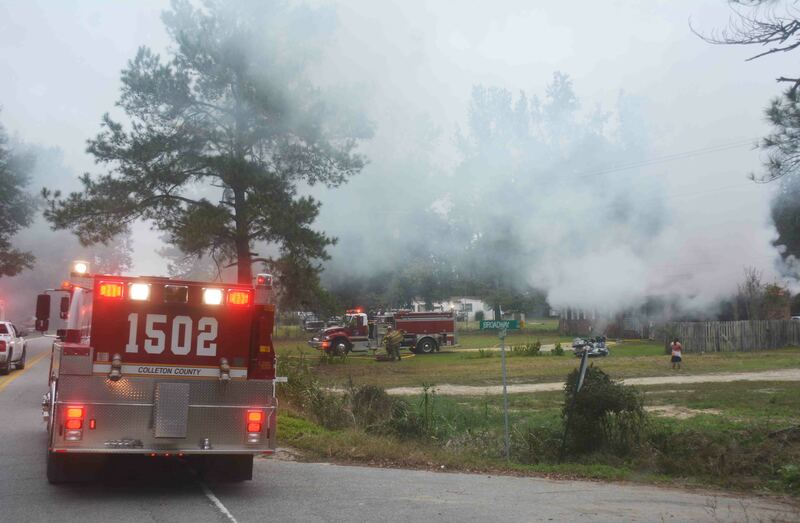 Firefighters saved a residential structure at 10685 Green Pond Hwy. Saturday morning 10-December. At 15:51 Fire-Rescue responded to a report of smoke coming the home at this location. Engine 6 arrived to find heavy smoke conditions coming from the two story dwelling. Crews deployed one 1-3/4 handline and made access through a scuttle hatch in the garage. The fire was contained to the attic. Click here for more information. 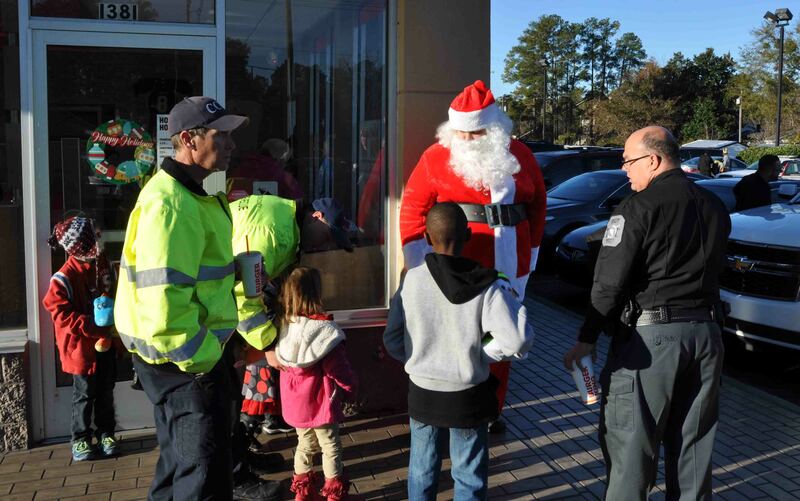 Seven members of Fire-Rescue participated with over twenty other emergency responders and Colleton County DSS to bring a brighter Christmas to needy children in our community. The annual event is sponsored by the Walterboro Police Department who spearheads the collection of donations to purchase the gifts for the children. This year Walterboro Police, Fire-Rescue, Walterboro Fire Dept. and the Sheriff’s Office participated. Click here for more information. 06/December/2016 - Service Award - Firefighter Frankie Marsh was recognized and awarded a plaque for 35 years of service during the Station # 15 Christmas Dinner held in Islandton Tuesday evening 06-December. Marsh was one of the founding members of the Islandton Fire Dept back in 1981 and has served continuously since that time. He recently retired from the department. Marsh has seen a great many improvements over the last three and half decades. The community members constructed their station on Ashton Road in 1981, conducted fund raisers to obtain funding and dispatched their responses for the first 12 years. 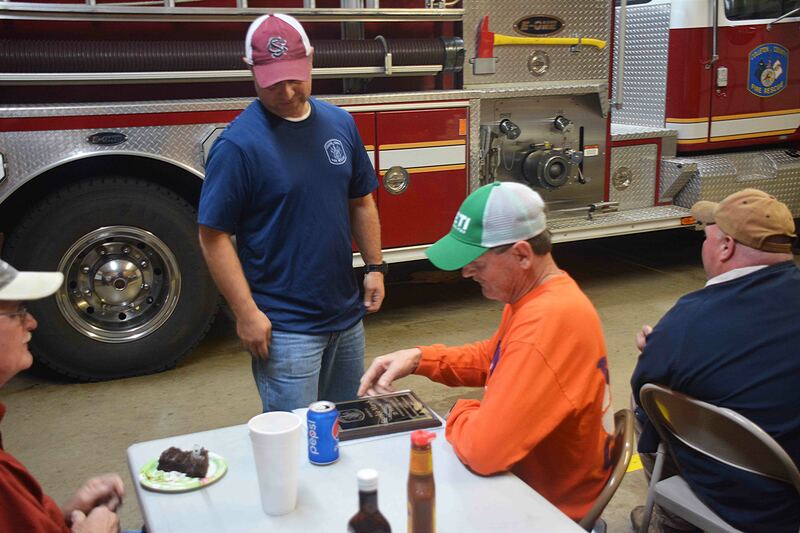 He watched the implementation of 9-1-1, centralized dispatching and upgrades in Fire Equipment as the Islandton Fire Department became Stations 10 and 15 as part of the county Fire-Rescue program that began in 1994. Colleton County Fire-Rescue will conduct pre-employment testing January 18-20, 2017. Click here for more information.